Images of patron saints stood at the north (left) side of the altar in a church. St Michael, a symbol of justice, divine power and protection against evil, was one of the most popular saints of the Middle Ages. Here he is shown feathered and trampling on a many-headed dragon with the Virgin standing behind him. In his left hand he is shown holding a pair of scales (the arms of which are now broken). On the right, a devil's head sits in the weighing pan, attempting to tip the balance, while to the left the Virgin lays her rosary on the arm of the scale to tilt them in favour of the soul which would have been held in the now-missing weighing pan on the left. The size of this figure suggests its importance. It was probably intended as a single devotional image, set within a winged tabernacle. The Archangel Michael weighing a soul with the Virgin interceding, relief in alabaster. 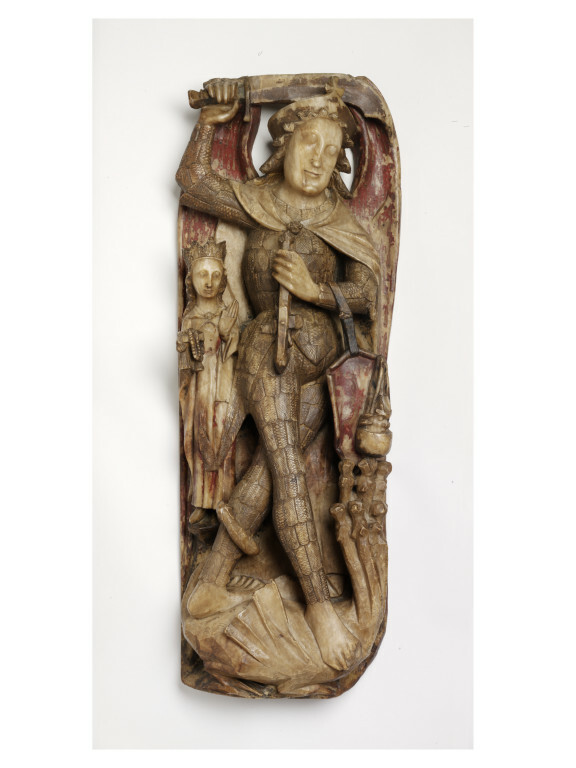 The Archangel Michael is shown attacking the multi-headed Dragon beneath his feet and holding a pair of scales (now broken) in his right hand. The head of a damned soul can be seen in the weighing pan on the right, while the Virgin intercedes on behalf of the blessed soul which would have occupied the pan on the left, now missing. 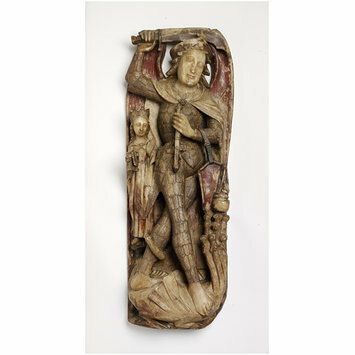 Nothing is known of the original provenance of this piece, before it was acquired by Lord D'Abernon, probably in 1926. 1926 was the year of Lord d'Abernon's retirement from public service, and his return from Berlin, where he had been Ambassador since 1920. Historical significance: Large carved and painted alabasters of this sort would have been a familiar sight in churches both in England and on the Continent. Saints like Michael, Christopher and the Virgin were often the subject of independent devotional images, which could act as the focus for prayers. These saints were believed to aid the supplicant, either in this life or the next. The size of this carving indicates that it was an image of some importance. St Michael was a symbol of justice, divine power and protection against evil. He was also one of the most popular saints of the medieval period, being called upon to aid the passage of the soul after death. The presence of the Virgin Mary, with her rosary, emphasises that this image was about the role of prayers to the Virgin and St Michael, which were believed to speed the soul's passage through purgatory. Trusted, Marjorie (ed.) The Making of Sculpture. The Materials and Techniques of European Sculpture London, 2007, p. 110 pl. 195. Images of patron saints stood at the north (left) side of the altar of the church. St Michael was especially popular. 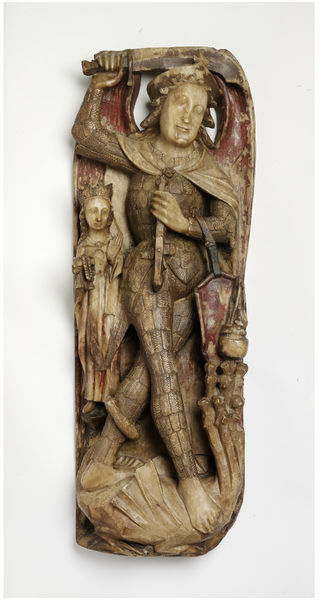 He is shown here trampling on a dragon and holding his scales of justice (now broken). Beside him stands the Virgin.